I Am NOT pliable, says the LORD. I cannot be manipulated! I AM NOT for sale and I cannot be controlled. I will not flex with the times and seasons or the culture! I AM CHANGELESS! My purposes cannot be altered. 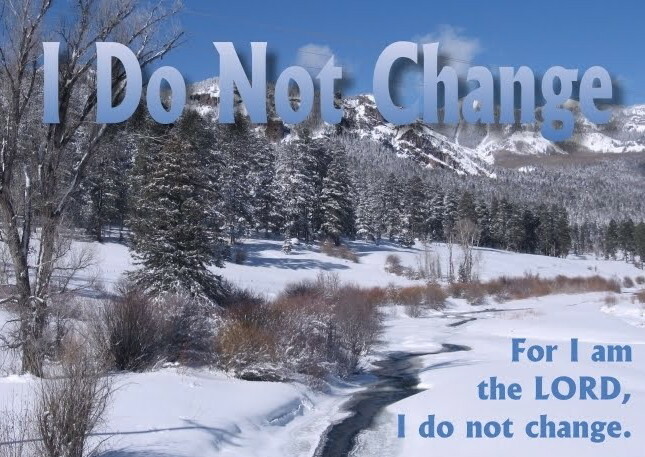 My Word and My Work and MY WILL cannot change. They are in complete agreement and inseparable. I remain untouched and unmovable. Nothing shakes Me or disturbs ME. I AM IN CONPLETE CONTROL! ALL TIMES AND SEASONS are in MY HANDS and nothing takes Me by surprise. I have purchased you for MY PLEASURE AND PURPOSE and you belong to ME! Do not put a price tag on yourself or put yourself on the auction block, says the LORD. Do not let the winds of adversity shake you or bend you. I have made you to be unshakable, unmovable, always abounding in MY work. Let the winds of MY SPIRIT MOVE you and propel you! Keep pace with ME and sour as I carry you on Eagles’ wings, says the LORD. You are not to be influenced by the World but to be a world changer, says the LORD. I DID NOT make you to fit in but to be different. COME OUT OF THE BOX, for I did NOT confine you to the narrow quarters and comfortable little corner of your world. COME OUT of the confines of your comfort zone and explore the new that I have for you. It is without walls and barriers. It is without measure. You cannot even see the little cloud over the horizon if you remain in the valley or stuck in the tent. COME OUT and come up HIGHER so that you can SEE what I want you to see and hear the sound of abundance of rain! As everyone around you despairs for the drought and the sight of their eyes and the hearing of their ears in their natural environs, I want you to see MY SUPERNATURAL POWER and PROVISION and PURPOSE AND PLAN that has nothing to do with restrictions and what man can do. Shed the fear of MAN and the fear of the enemy and get a glimpse of MY GLORY. For you have not been created to conform to the World and the culture and the normal, but purchased to be translated into MY KINGDOM, to see MY POWER and MY GLORY expressed in you and upon the earth, says the LORD.